APPRAISEMENT ( in the later Hebrew). Appraisement of Slaves and Movables. The setting of a value by a court of justice either upon property, or upon damage done to person or property. It differs from Estimate (Hebrew ), the fixing of values by the Law itself. The Appraisement of damages, or "measure of damages" as it is termed in English law, can best be treated along with the rules for awarding compensation under the several heads dealing with wrongs and remedies, such as Accident or Assault. We have here to deal with the Appraisement that becomes necessary when property—principally land—is taken for debt, or is divided between joint owners. In some New England States, even now, the land of the debtor may be turned over to the creditor at a valuation in satisfaction of his judgment, instead of being sold to the highest bidder, as elsewhere. This is called "extending" the land: a course more merciful to the debtor than a public sale; for there is no risk of the land being sacrificed. In the Talmudic law this was the only method for subjecting the land of adults to the payment of debts. The Mishnah, in considering which part of a debtor's land shall be first taken to satisfy any demand, lays down this rule in Giṭ. v. 1: The injured are paid from the best ('iddit); creditors, from the middling (benonit); the widow's jointure, from the poorest (zibburit). The debtor's lands were deemed the main reliance for all claimants, movables being too uncertain and fleeting. That the favored claimant should be paid from the most available parcels shows that the debtor's land was not to be sold, but turned over in satisfaction; for otherwise it could make no difference which part of his lands was levied upon first. The instrument by which the court awards to the creditor the debtor's land, as valued, is known as a "letter of appraisement" (iggeret shum) (Mishnah B. M. i. 8). In later practise (Ḥoshen Mishpaṭ103), following a baraita (B. B. 107a), we always find three appraisers mentioned, who are appointed for that purpose and who act in place of the judges. In the language of the Mishnah these are said to "go down" to appraise, meaning that they start from the seat of justice and go to view the field, or parcel, to be valued. Their valuation is reported to the court, and, when approved, becomes the act of the court. The season of the year and the state of the land market must be taken into consideration; thus the Talmud assumes that there is a better market in Nisan than in Tishri (B. Ḳ. 7b). When only two of the three appraisers agree, the opinion of the third is disregarded; but when each of the three names a different value, the early sages (B. B. 107a) disagree as to the mode of striking the mean: whether to add the three estimates together and divide by three, which would be the most natural course; or to give the preference to the two lower estimates, either at the arithmetical mean, or at twothirds of the difference above the lowest. The Talmud decides for one of the latter methods—called by the early sages that of the judges of the Exile—but the later authorities (Ḥoshen Mishpaṭ, l.c.) favor the average estimate. The interest of orphans, that is, of infant heirs whose lands are to be taken for the obligation of their father, or, speaking generally, their ancestor, is further guarded by advertisement (hakrazah). The Mishnah ('Arakin vi. 1) says: "Appraisement of orphans' lands is thirty days; that of consecrated things is sixty days, and they cry it out every morning and evening." 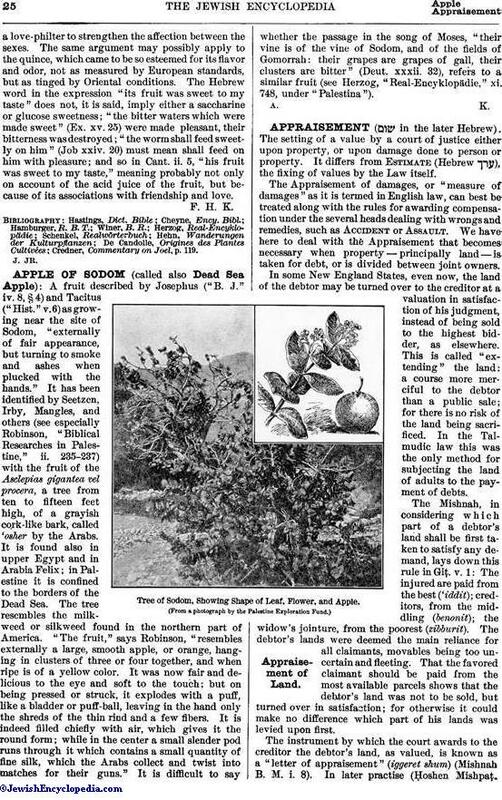 The commentary of Bertinoro—abridging the discussions of the Talmud on the subject—says: "The judges that go down to the estate of the orphans to sell it for debt appraise it, and cry out for buyers on thirty continuous days, day after day: in the morning when workmen go out to the fields—that any prospective buyer may direct his employees to look at the field and report; and in the evening when the workmen come back, so that he who hears the announcement may be reminded of the business in view and obtain the necessary information." After land has been "appraised" to the creditor, or (in New England legal language) after it has been "extended" to him, his title may be lost under the Talmudic law, upon a subsequent review and annulment of the judgment, under the usual conditions for such revision. When slaves, movables, or written obligations were sold for debt there was no previous advertisement. 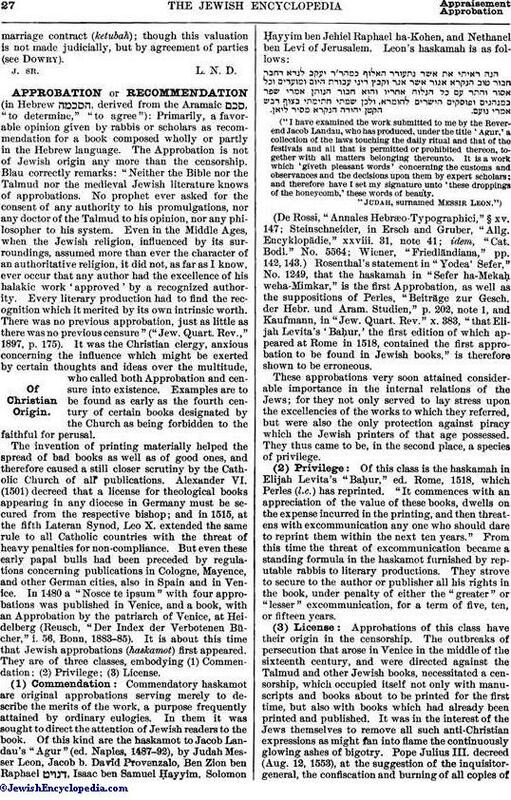 Under the older Talmudic law movables of the debtor were not answerable at all in the hands of his heirs; but during the Middle Ages, when, in most countries, Jews were not allowed to own land, a remedy against the chattels and effects of the decedent had to be given as a matter of necessity. But in the Talmud no definite directions are found as to how movables or effects are to be appraised. Movables are supposed to be nearly akin to money, and to bear something like a fixed market value. When movables of the living debtor are turned over to the creditor in satisfaction, no commission of appraisers intervenes to fix the value; but the court seeks to bring about an understanding between debtor and creditor. However, obligations on third persons are appraised, the solvency of the obligor and the time of maturity entering as elements (Ḥoshen Mishpaṭ, 101, 2, 3, 5). As has been said above, when a judicial sale is made in conformity with all the requirements in the matter of Appraisement and of advertisement, where law and custom demand it, it is binding on all parties. But where proper advertisement has been neglected, the law of "overreaching" applies, and the sale may be rescinded for an excess or shortage in the price of one-sixth over or below the true value (Ket. 100b); and this though in dealings between man and man, the law about "overreaching" applies to movables only. In the division of an estate Appraisement becomes necessary; but, for the most part, a court will have to intervene only when some of the heirs are infants and the others are of full years. As long as all are under age no one can ask a division; when they are all of full age they can generally arrange a division among themselves. 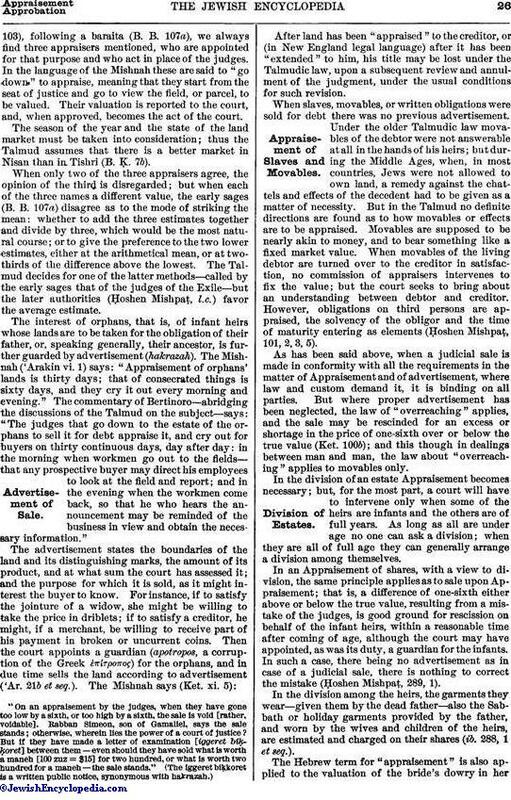 In an Appraisement of shares, with a view to division, the same principle applies as to sale upon Appraisement; that is, a difference of one-sixth either above or below the true value, resulting from a mistake of the judges, is good ground for rescission on behalf of the infant heirs, within a reasonable time after coming of age, although the court may have appointed, as was its duty, a guardian for the infants. In such a case, there being no advertisement as in case of a judicial sale, there is nothing to correct the mistake (Ḥoshen Mishpaṭ, 289, 1). In the division among the heirs, the garments they wear—given them by the dead father—also the Sabbath or holiday garments provided by the father, and worn by the wives and children of the heirs, are estimated and charged on their shares (ib. 288, 1 et seq.). The Hebrew term for "appraisement" is also applied to the valuation of the bride's dowry in hermarriage contract (ketubah); though this valuation is not made judicially, but by agreement of parties (see Dowry).